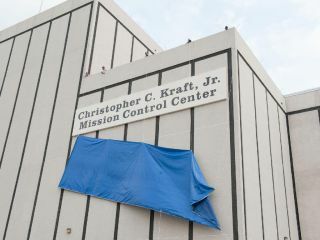 After more than 45 years of service to the nation's space program, the naming for NASA's mission control center became official with the unveiling of a new nameplate on the building, designating the legendary building as the Christopher C. Kraft, Jr., Mission Control Center. America's first human spaceflight director, Christopher C. Kraft Jr., received top honors from NASA Thursday (April 14) when the space agency rechristened its storied Mission Control Center in his name to mark his contribution to space exploration. Dr. Christopher C. Kraft Jr. responds to a large crowd of admirers during a formal celebration of a naming for the facility and the unveiling of a new nameplate on the building. "Without Dr. Kraft’s leadership, the concept of mission control would not be what it is today," Coats said. "The dedicated people inside this building have accomplished incredible things over the last five decades based on the foundations laid by Dr. Kraft and his early flight control development team." Hundreds of NASA employees applauded as the nameplate was unveiled, NASA officials said. Then it was Kraft's turn to speak. NASA renamed its Mission Control center after Kraft during a landmark week for human spaceflight. On April 12, the world marked the 50th anniversary of the first human spaceflight by cosmonaut Yuri Gagarin in 1961. It was also the 30th anniversary of NASA's space shuttle program. Dr. Christopher C. Kraft Jr. is seen at his Flight Director console in the Mission Control Center during Gemini-Titan V flight simulation. As flight director, Kraft managed all of the Mercury and several Gemini missions. He was in that role for America’s first human spaceflight, first human orbital flight and first spacewalk. He also was one of the designers and implementers of the Mission Control Center, the heart of all NASA crewed space missions for the last five decades. According to NASA officials, Kraft's instructions from his boss, Chuck Mathews, consisted of the following: “Chris, you come up with a basic mission plan. You know, the bottom-line stuff on how we fly a man from a launch pad into space and back again. It would be a good idea if you kept him alive." Kraft did that, and more, NASA said. Through his leadership, the Mercury Control Center took shape at Cape Canaveral, Florida, and his concept of "Mission Control" was tested and developed successfully as he served as the flight director for seven unmanned and six manned missions during the Mercury program, agency officials said. Kraft continued to work through the Gemini program and beyond. During the Apollo program, he became director of flight operations — the official responsible for the overall manned spaceflight planning, training and execution. His leadership in this arena continued through Apollo 12 in 1969, officials said. Dr. Robert R. Gilruth (right), MSC Director, sits with Dr. Christopher C. Kraft Jr., MSC director of flight operations, at his flight operations director console in the Mission Control Center during the Apollo 5 unmanned space mission. After that, Kraft became deputy director of what is now Johnson Space Center. He served as the center's director from January 1972 until his retirement in 1982, playing a vital role in the success of the final Apollo missions, the Skylab manned space station, the first international space docking during the 1975 Apollo-Soyuz Test Project and the first space shuttle flights. In retirement, Kraft has served as a consultant and board member of various Houston companies and as director-at-large of the Houston Chamber of Commerce. His book, FLIGHT: My Life in Mission Control, was published in 2001 and was a New York Times bestseller, NASA officials said.